Is your dog paw swollen? Don’t fret. That is a common complaint among dog owners. The paws are constantly exposed to environmental irritants such as pesticides, salt (in winter), heat, and allergens. Couple this with sweat and you have the making for occasional dog paw irritation and inflammation (swelling). This article provides handy remedies and tips that you can use to soothe swollen dog paws. Why is My Dog Paw Swollen? Damaged nail. Is one dog toe swollen around the nail? You could be dealing with a broken nail. Like humans, dogs’ nails can get damaged as a result of injuries, infections, tumors, and exposure to chemicals among other factors. Foreign object. For swelling that only involves one pad, a foreign body that is trapped between the toes or the pads could be to blame. Classic examples include thorns and splinters. Insect bites and bee stings. One swollen dog paw may also indicate an insect or spider bite, wasp or bee stings, or even snake bites. The swelling is often confined to the top of the paw, but it can as well occur anywhere else. Broken toe. A toe fracture is another likely cause of a swollen paw in dogs. If that is the case, the swelling is most likely to be confined to the paw, without affecting the leg. Tumors. In some cases, dog paw swelling is an indication of tumors. The tumors are often hidden between the toes. For the best outcome, cancerous tumors should be treated early enough to control their spread. Tumors of the toes tend to affect dogs older than 10 years. Labradors, standard poodles, and other large breeds are particularly susceptible and so are black colored pooches. Allergies. Allergies to grass pollen, foods, and poison ivy among other allergens can also explain swollen dog paws. 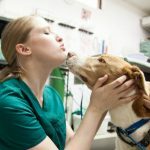 The swelling is usually attributed to constant licking and chewing and, as a result, it often involves the front paws only, with the rear feet appearing okay. Check your pooch’s ears too. Are they swollen or red in appearance? What about the skin on her tummy? Does it have red spots? Then chances are that you are dealing with an allergic reaction to something. Burns and abrasions. Is your dog paw swollen after a walk or exercising your dog on a hot afternoon? Chances are that she has sustained a burn on the pads. This is common during summer and occurs after walking your dog on hot asphalt or concrete road. Walking on hard surfaces such as gravel and jagged, rocky terrains can as well abrade the pads and make them reddened, with an accompanying swelling in the paw. You will know you are dealing with a burn or abrasion if the swelling affects all the four paws. Overexertion. If swelling occurs after spending significant time exercising your dog, she could have been over-exerted. Heart problems. 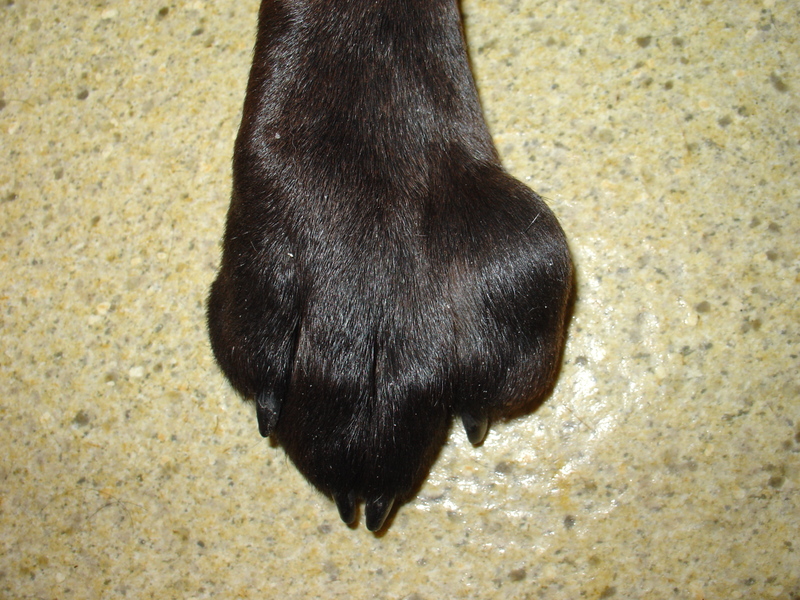 Swollen dog paws that occur alongside coughing may be an indication of a heart problem. This can occur moments after exercising your dog. Infections. Both bacterial and fungal infections can cause swelling of dog paws. It is common for the swelling to be accompanied by itching and redness, and sometimes a slightly unpleasant smell. Itching often leads the dog to constantly lick the paws, which may, in turn, aggravate the situation. There may also be pus discharge and the affected paw may feel hot to touch. A trip to the vet is recommended if you think you are dealing with an infection. For starters, you should inspect your dog’s paws and pads for any foreign objects that may be stuck between the toes (such as thorns and splinters), as well as stings and bites. 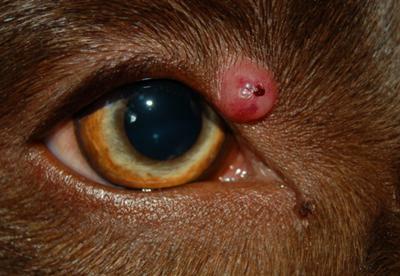 As you do this, you may also spot tumors, which would warrant immediate attention from your vet. If any foreign object identified has not punctured through the skin or caused serious injury, you can safely remove it at home. Follow it up by thoroughly cleaning the paws. Want to watch out for any infection in the area in the coming days and weeks. Most insect stings and bug bites will subside within 24 hours, but if no improvement has been seen a day or two later, take your pooch to the veterinarian. The same applies if you observe any signs of allergic reaction to the sting, such as labored breathing, hives, and increased swelling. Mix 2 tablespoons of Epsom salt with a liter of warm water in a basin, bowl, or laundry room sink. Stir well until all the salt dissolves. Soak your dog’s feet in the solution for a couple minutes. Pat the paws dry with a towel. Pour enough water to cover your dog’s feet into a tub, basin, or sink. Add enough iodine to make the color of the water similar to that of iced tea. Make your dog stand in the water (or dunk their feet in it) for a few minutes. Dry the paws thoroughly with a towel. Treat your dog three times per day until the swelling subsides. Some people have found covering the dog’s paws with a cotton pad that has been soaked in an iodine solution just as effective. Take note of any smell emanating from your canine friend’s paws. Cheesy smell is usually indicative of yeast infection. Soaking the paws in apple cider vinegar may help. Otherwise, take your dog to a vet for appropriate treatment. If your dog was over-exerted during exercise to the point of swelling (with no coughing observed), give her time to relax and recover and she will be well. You will also want to limit the duration of exercise the next time. If you suspect burns or abrasion by hard surfaces, soak your dog’s feet in cool water or, better still, cool chamomile tea to help soothe her sore pads and subside the swelling. If the paws are discharging, appear bright red, or feel hot to touch, you should seek veterinary attention right away. PetHealthNetwork: What Should You Do if Your Dog Has a Swollen Toe?